Ever wonder why health experts recommend eating foods rich in folate, niacin, riboflavin and other B-complex vitamins? These nutrients regulate every function in your body, from energy metabolism to red blood cell formation. They also support brain health and mental function, keeping your nervous system functioning optimally. Depending on your needs, you can obtain this nutrient from food, take a vitamin B-complex supplement, or both. B-Complex is a supplement that provides all the B vitamins, which supports energy metabolism, red blood cell formation and brain health. Each has a distinctive role in the human body. According to a 2016 review published in the journal Nutrients, the vitamin B complex supports energy production, DNA synthesis and brain function. It helps your body convert food into energy and aids in the formation of various neurochemicals. Some B vitamins aid in protein synthesis; others play a key role in the production of enzymes, promote tissue repair and regulate glucose uptake. When consumed in optimum doses, these nutrients keep your immune system strong, protect against free radical damage and support hormone production. Without vitamin B, your body would be unable to break down protein, carbs and fats and use them for fuel. Therefore, even the slightest deficiency can take a toll on your health. Your body needs all eight B-complex vitamins to function at its peak. Vitamin B1, for example, supports cell growth and energy metabolism. As Medline Plus points out, this nutrient regulates muscle, nerve and heart function, protects against inflammation and helps transport electrolytes throughout the body. Vitamin B12 or cobalamin, which is found mostly in animal foods, may prevent anemia, age-related macular degeneration and canker sores. According to a 2016 clinical trial that appeared in the European Journal of Nutrition, vitamin B12 supplements may increase breast milk supply and reduce inflammation in infants. Vitamin B6 or pyridoxine helps optimize energy utilization and promotes cellular health. As Live Science notes, this nutrient assists with the production of neurotransmitters in the brain and supports immune function during pregnancy and infancy. If your diet is low in vitamin B6, you may experience skin problems, depression, anemia and other symptoms. These nutrients play a major role in brain health. According to Bayer, vitamin B regulates the cellular metabolic processes that allow your body to convert food into energy. At the same time, they support the formation of red blood cells that transport oxygen to your brain. 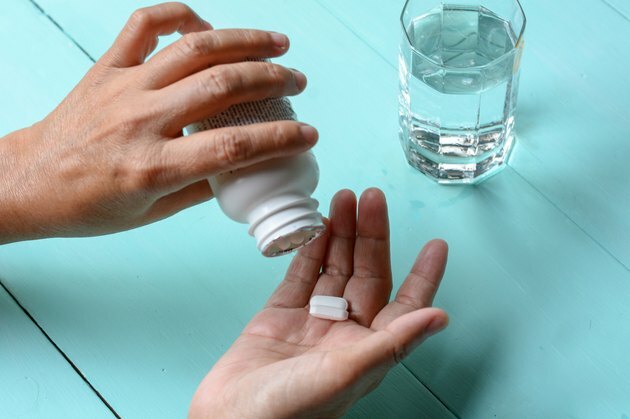 A 2015 case report published in the journal Clinical Case Reports points out that niacin supplements may relieve Parkinson's disease symptoms, even when used in low doses. No side effects have been reported. Researchers believe that niacin may increase or restore the levels of GPR109A, an anti-inflammatory protein receptor. Other studies indicate a strong link between B-complex vitamin deficiencies and depression. If your diet is low in these nutrients, you may experience memory problems and cognitive impairment. Over time, vitamin B deficiency may lead to dementia and depression. B-complex vitamins assist with the conversion of protein, fats and carbs into energy. Therefore, they may help you achieve and maintain a healthy body weight. A study published in the World Journal of Diabetes in 2015 associates deficiencies in vitamin B1, vitamin D and folate with obesity and diabetes. Even though these nutrients don't burn fat or boost your metabolism, they allow your body to use energy more efficiently. Read more: Does Vitamin B Complex Help You Lose Weight? Vitamin B12, for example, has been shown to lower stress levels. In the long run, stress contributes to obesity while raising your risk of chronic ailments. A diet low in vitamin B12 may affect your body's ability to deal with stress and may lead to weight gain. Up to 40 percent of women of reproductive age are struggling with premenstrual syndrome (PMS). This condition is associated with pelvic and abdominal pain, mood swings, bloating, digestive distress, depression and more. According to a 2016 article published in Today's Dietician, vitamin B may prevent and relieve PMS symptoms. Thiamine and riboflavin appear to be particularly effective. These nutrients regulate glucose metabolism, serotonin synthesis and other biochemical processes. The article also notes that vitamin B6, which helps your body synthesize the amino acids tyrosine and tryptophan, may improve mood and alleviate some psychological symptoms associated with premenstrual syndrome. Whether you want to work out harder, recover faster from training or enjoy greater endurance, B vitamins may help. Make sure your diet supplies optimum doses of vitamin B6, vitamin B12 and folate. These three nutrients regulate amino acid metabolism, DNA synthesis, red blood cell formation and other processes that play a vital role in sports performance. As Mayo Clinic notes, vitamin B12 won't make you a better athlete, but it may indirectly enhance your performance by keeping your metabolism functioning optimally. Low levels of this nutrient have been linked to muscle weakness, fatigue, mood swings and digestive distress. So, it's important to meet your daily vitamin B12 intake requirements. B-complex vitamins are water-soluble, so the excess is eliminated in your urine. However, vitamin B overdose may occur under certain circumstances. If you take large doses of vitamin B supplements, you may experience adverse reactions. Additionally, some B vitamins in supplement form can interfere with anxiolytics, NSAIDs and other drugs. Niacin overdose, for example, may raise blood sugar levels, cause liver problems and contribute to gout. Diarrhea and frequent urination are common in those who take too much riboflavin. Excessive vitamin B6 can increase your risk of nerve damage. When consumed in large doses, folic acid may increase the risk of heart attack in people with existing cardiovascular problems. Who Should Take B Vitamins? Unless you suffer from Crohn’s disease, ulcerative colitis or other disorders that may affect nutrient absorption, your daily intake of B vitamins should come from food, not pills. Dietary supplements are usually prescribed to those who are at risk for deficiencies or have special nutritional needs. Pregnant women, for instance, are more likely to develop vitamin B12 deficiency. This may lead to neurologic symptoms, miscarriage, gestational diabetes, preeclampsia and preterm birth, according to a 2015 review article published in the journal Advances in Nutrition. Folate deficiency appears to have similar outcomes. These nutrients can be found in a wide variety of foods, from meat and dairy to fresh fruit, vegetables, nuts and seeds. Fortified grains, whole grains, fruits and veggies are all excellent sources of folic acid. Vitamin B6 occurs naturally in animal products, such as fish, poultry and beef, as well as in dark leafy greens, cantaloupe and citrus fruits. If you're a vegan or vegetarian, you may find it difficult to get enough vitamin B12 since it occurs mostly in animal foods. It's estimated that up to 86.5 percent of vegetarian adults and up to 33 percent of vegetarian children suffer from vitamin B12 deficiency. People who don’t eat meat, dairy and eggs can either take vitamin B12 supplements or fill up on chlorella, mushrooms, seaweed, tempeh, spirulina, sauerkraut and other plant-based foods containing this nutrient. Nutritional yeast, fortified grains and fortified vegetable milk may also help prevent deficiencies. Medical News Today: What Is Thiamin, or Vitamin B1? World Journal of Diabetes: Vitamin Paradox in Obesity: Deficiency or Excess? Current Obesity Reports: Stress and Obesity: Are There More Susceptible Individuals?